Iwaki is a seaside town in the Fukujima Prefecture in Japan. Last Friday, on March 11, Iwaki was struck by the Tohoku Earthquake and Tsunami, and is now under the threat of multiple nuclear reactor meltdowns. The radiation leaks due to the hydrogen explosion have driven all residents of Fukujima Prefecture to flee to other parts of Japan, if they were lucky enough to survive the initial impact. Today, on the fifth day after the devastating catastrophe, the studio finally spoke to Mr. Shiga Tadashige 志賀忠重さん on the phone. He and his family have safely arrived in the Chiba Prefecture, located in the Greater Tokyo Area. His house in Iwaki was destroyed during the earthquake, and the town is now a restricted zone. He has just heard from the rest of our friends from Iwaki, Mr. Fujita Chuhei 藤田忠平さん, Mr. Maki Takashige 真木孝成さん, Mr. Ono Kazuo 小野一夫さん, Mr. Kanno Yoshio 菅野佳男さん, Mr. Shiga Takemi 志賀武美さん, and Mr. Nawa Makoto 名和 良さん, who are now all spread across the country after the evacuation. Fortunately, they are all safe and unharmed. Cai invited Mr. Shiga to stay in his hometown, Quanzhou, China for the time being, to which Mr. Shiga replied that he regretted he left his passport behind amidst the chaos and panic. This is the latest news we have heard this morning, and if we have any more updates regarding our friends in Japan, we will let everyone know. Hopefully the radiation issues will soon be under control and resolved, and our friends will be able to return home and start to rebuild their lives. Thank you for all of you who have voiced your concerns about our friends from Iwaki. Method: A mold in the shape of Bigfoot’s footprint will be made. Paper footprints will be made by pouring paper pulp into a footprint-shaped mold. Some fireproof material will be put on the bottom of each footprint to prevent overburning. After the exhibition, all the footprints will be collected. Obtaining concurrent visas for the two countries where the project will be carried out will be one of the elements of the piece. When humankind finally invents the hyper-speed vehicle, it will be able to catch up with the past and understand it. This leap will be more significant than going to the moon by spacecraft and bringing back some stones. More important than the exploration of unknown space with physical inventions is the fact that humans are originally a part of universe – the human spirit was born at the time of the creation of the universe, and actually contains vivid memories of the event. Human consciousness can recall memories of the past, and therefore, at a deep level, it has insight into future human direction, potential and danger. The past, including memories of the origin of the universe, and the future can’t be received through physical entities or existing time and space. Only super-humanity is capable of traveling beyond light-speed without being limited by time and space. With a series of gunpowder explorations covering 2,000 meters in 20 seconds, the footfalls of Bigfoot will stomp into the beyond. It will be a moment of a hyper-creature passing through our planet. Is it the Extraterrestrial or ourselves? The moment when the spirit is present, it will leave physical footprints on the border and will vanish beyond time and space. When did humans start practicing the unfortunate custom of recognizing national borders? Along these lines, artificial creations that never originally existed, humans have most frequently used the gunpowder which is one result of civilization – and will continue to do so in the future. Every time gunpowder explodes on a border, war occurs and the nightmare is replayed. The extraterrestrials ignore borders, and the will of super-humanity that lives within us sometimes exercises its fundamental power and also ignores boundaries. Everywhere on earth, there is a horizon that is common to all of humanity, but beyond this horizon, however, there is a place to which we must head through the collaboration of all humankind. It is where we swiftly came from and where we will return… the horizon of the universe. These project notes and folding screens were created in 1990 and exhibited for the first time in early 1991 at the solo exhibition Primeval Fireball: The Project for Projects at P3 Art and Environment in Tokyo. Since then, it has been exhibited at seven other museums or galleries around the world. Bigfoot’s Footprints began as a project to be carried out along the border between France and Germany, to be staged later, in 1994 along the Normandy coast as part of ceremonies marking the 50th anniversary of the Allied landings. In 2004, the work was shown in Washington D.C. as part of the Traveler solo exhibition at the Smithsonian Institution’s Arthur M. Sackler Gallery and the Hirshhorn Museum and Sculpture Garden. 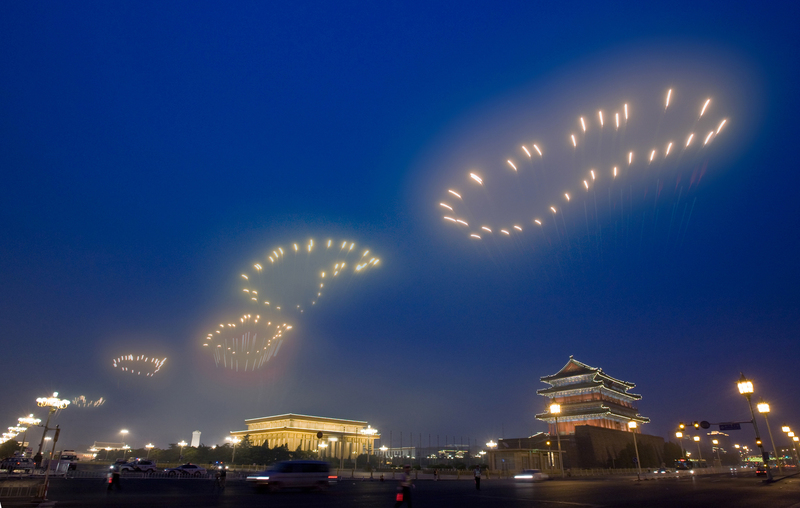 Finally, in 2008, 29 giant footprints appeared in the sky along the central axis of Beijing when the project was realized as part of the Opening Ceremonies for the 2008 Summer Olympics. Photo by On-Works International Multimedia Co., Ltd. 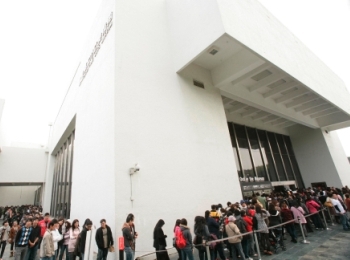 This past weekend, Hanging Out in the Museum came to a close at the Taipei Fine Arts Museum. On the last day, the galleries were completely packed—over 14,000(!) visitors came to catch one last glimpse of the show. Cai also made a special trip to Taipei to make some closing remarks in person. A few stats: over the course of three months, the exhibition drew approximately 220,000 visitors, and it was reported that thirty percent had never before been to an art museum. The exhibition topped TFAM’s Arcadie Dans les Collections du Centre Pompidou show and also set a record for having the highest attendance among contemporary art exhibitions in Taiwan. Check out the official exhibition web site for more details (in Chinese). 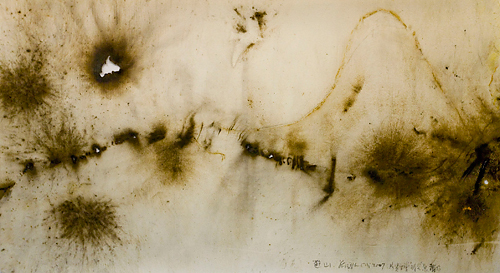 Cai Guo-Qiang will donate a gunpowder drawing, Excursion—Test for Light Passage at Shiseido Gallery, to a charity auction whose proceeds will benefit earthquake relief efforts in Haiti. The auction, held by China Guardian, i scheduled for March 21st at 7:00 p.m. in Beijing. The work can be viewed during the preview on March 18th and 19th. Check the China Guardian website for further updates. In support of Cai’s long-time friend, Issey Miyake, the Studio posts a link to Mr. Miyake’s recent letter in the New York Times Op-Ed section, which shares hopeful thoughts about peace. The letter can also be found in a recently published book for learning English through texts about peace. In 2008, Cai had an exhibition in Issey Miyake’s hometown, Hiroshima, Japan. The photo below shows the installation view at Hiroshima City Museum of Contemporary Art.